It was David vs. Goliath, with U.S. playing Goliath. When reports that further firing occurred on August 4, President Johnson quickly asked Congress to respond. With nearly unanimous consent, members of the Senate and House empowered Johnson to "take all necessary measures" to repel North Vietnamese aggression. The Tonkin Gulf Resolution gave the President a "blank check" to wage the war in Vietnam as he saw fit. After Lyndon Johnson was elected President in his own right that November, he chose escalate the conflict. 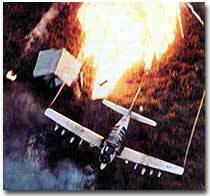 The United States also bombed the Ho Chi Minh trail, a supply line used by the North Vietnamese to aid the Vietcong. The trail meandered through Laos and Cambodia, so the bombing was kept secret from the Congress and the American people. More bombs rained down on Vietnam than the Allies used on the Axis powers during the whole of World War II. Often unable to see the enemy through the dense growth of Vietnam's jungles, the U.S. military sprayed a chemical herbicide known as "Agent Orange" in an attempt to destroy the trees. Currently, debate rages on whether or not exposure to this compound is responsible for disease and disability in many Vietnam veterans. One of the most confounding problems faced by U.S. military personnel in Vietnam was identifying the enemy. The same Vietnamese peasant who waved hello in the daytime might be a VC guerrilla fighter by night. The United States could not indiscriminately kill South Vietnamese peasants. Any mistake resulted in a dead ally and an angrier population. The media played an important part in shaping the public's opinion towards the conflict in Vietnam. Television brought the horrors of war into millions of homes, as did photos like this one of a young Vietnamese girl fleeing a napalm bombing. By the end of 1965, there were American 189,000 troops stationed in Vietnam. At the end of the following year, that number doubled. Casualty reports steadily increased. Unlike World War II, there few major ground battles. Most Vietnamese attacks were by ambush or night skirmishes. Many Americans died by stepping on landmines or by triggering booby traps. Although Vietnamese body counts were higher, Americans were dying at rate of approximately 100 per week through 1967. By the end of that year there were nearly 500,000 American combat troops stationed in Vietnam. A pictorial history of the war in Vietnam, complete with info and descriptions of each of these remarkable pictures is shown here. 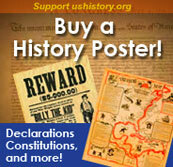 A short introduction explains the American entry into the war; maps, links, and a timeline complete this fantastic site. Click on the sitemap for an overview of all images with links to each page. A tremendous timeline, detailing all the events from JFK's commitment to Southeast Asia in 1961 to the Gulf of Tonkin and the end of 1964. The writing is very concise and easy to read; here is the introduction to the Vietnam War that will fill in all the reasons why the U.S. entered the ground conflict in 1965. Read a short summary at this Federation of American Scientists site of the on-and-off, controversial, 2-1/2 year bombing campaign called Operation Rolling Thunder. It was designed to thwart Ho Chi Minh in his efforts to take over South Vietnam, yet not so much as to incite Russia or China to come to the aid of the communists. 2/3 of the men who served in Vietnam were volunteers, while 2/3 of the men who served in World War II were drafted. 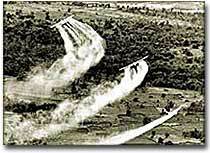 Agent Orange wasn't the only chemical used to defoliate the Vietnamese countryside; the U.S. also used Agent White, Agent Purple and Agent Blue with devastating long-term effects.